with high quality products and customer service. We use the highest quality ingredients to create the best tasting frozen beverage available. 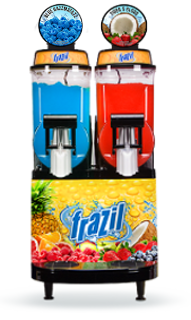 Frazil is available in over 20 extreme fruit flavors. Our programs are a balance of risk and reward. Most retailers make between 30%-60% depending upon the program and price points. We are dedicated to building our brand and provide our retailers with marketing and promotional materials needed to maximize sales and profits. Our service partners are available 24/7 to answer your questions and we resolve 90% of all problems within 48 hours. We don't believe in holding our customers hostage with lengthy contracts that take a team of lawyers to interpret. Our contracts are straight forward and easy to understand. We believe that success comes from strong partnerships. We partner with the best distributors and service partners in the industry. Maximize Profits and ROI. You own the machine and take responsibility for all routine and reactive repairs and maintenance. In return you will purchase the Frazil product at the best possible price with gross profit margins of around 60%. With more risk comes more potential reward. Balance risk and profits. A best-in-class solution where you own the machine and we take responsibility for all reactive repairs and maintenance for the machine. You will purchase product at a slightly up-charged price with gross profit margins of around 50%. With the managed service program there are never any hidden costs or surprises. Minimize risk and share the profits. We purchase the machines and take responsibility for all reactive repairs. We maintain ownership of the machine for the life of the machine and up-charge the cost of the product to cover the cost of our investment. Gross profit margins of around 30%. With this program you have minimal risk and share the profits.